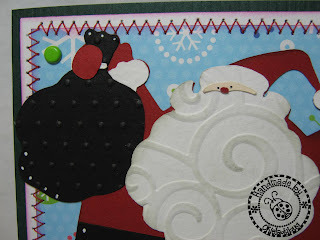 I cut these little happy Santa's from Holly Jolly right after I got the cart but I couldn't figure out how to do a card with them. I bet I cut 3 or 4 different pieces of paper trying to get them to work before I liked what I ended up with! Next time I think I will cut him a little smaller. I believe I cut him at 3 1/2" and he is almost too big for the card. The background papers are from a DCWV Christmas stack from a few years ago. I have used the heck out of this stack and I am still using it!! I did decide to sew on the card and I think it made it look better. The ribbon is 1/4" grosgrain. The brads are Spareparts from Hobby Lobby. Ya'll know I am some kinda crazy about brads! I used a Cuttlebug folder for the HO's and it actually said Happy Holidays on part of the folder and I just cut small pieces of aluminum and then trimmed after I embossed so I could just use the HO part. It took me awhile to get all the HO's I needed but I think it was worth the effort. The aluminum is from some pans I got at school quite awhile ago and I love putting it through the Cuttlebug! I tried coloring the letters but couldn't get it to work so they remain just plain ol silver. 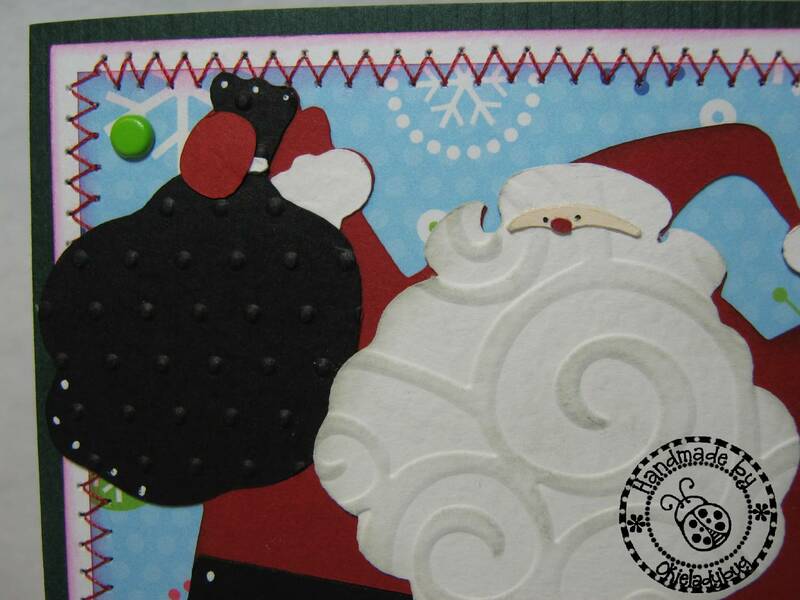 On the Santa I used Divine Swirls for his beard and then Swiss Dots on his sack. I went over the swirls lightly with a gray Colorbox Cat Eye ink pad. You can also see the sewing a little closer. If you guys are trying to think of something to tell someone to get you for Christmas I think you should tell them you need a Janome Sew Mini! I am still so lovin mine! 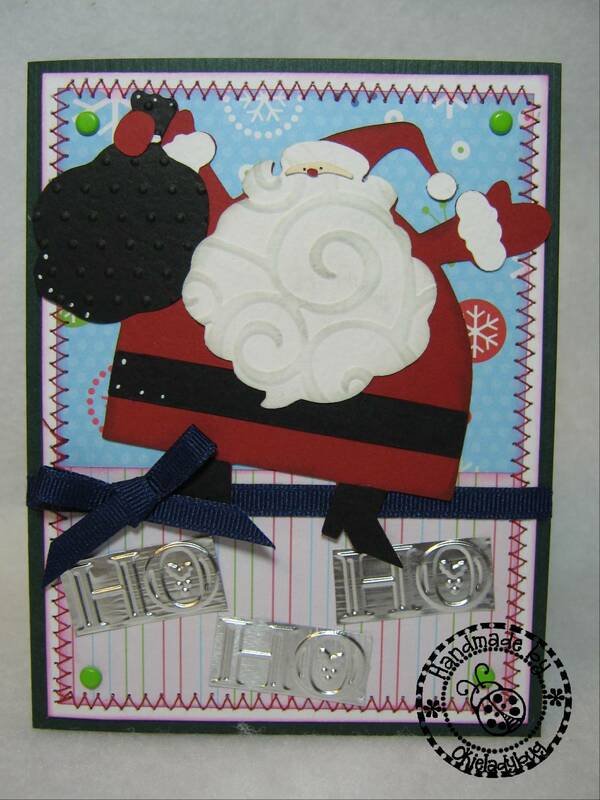 I have my office Christmas party tonight so won't be able to craft and then I have my Stamp Club all day stamping event on Saturday so I might not have anything to post for a few days. 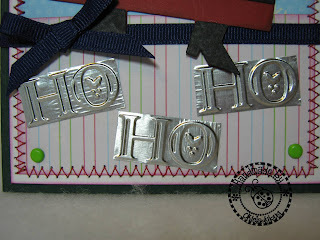 What a fun card ... Love those silver Ho Ho Ho's ... and I think they look super in silver. Another fun card! Love your card Okie, but heck I love everything you make...just about (lol). Smooches! Very cute card. I love the detail and the Ho Ho Ho's are perfect. This is SOOOO adorable!!!!!!! I love the HO HO HO's!!! You are such a wonderful enabler! Thanks! 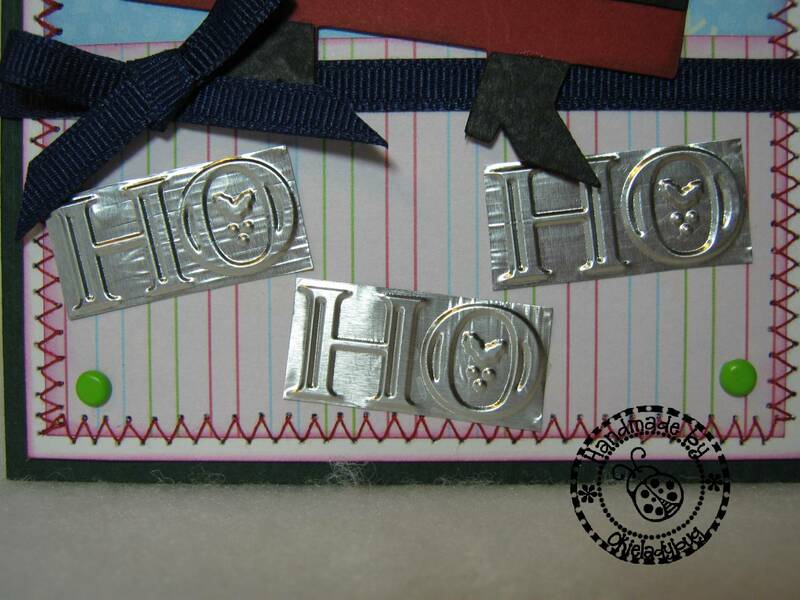 Love all the embossing and Ho's look good in silver ;~D. There I said it,lol.I know you were all thinking the same thing. cute card I ordered this cartridge cant wait to get it.